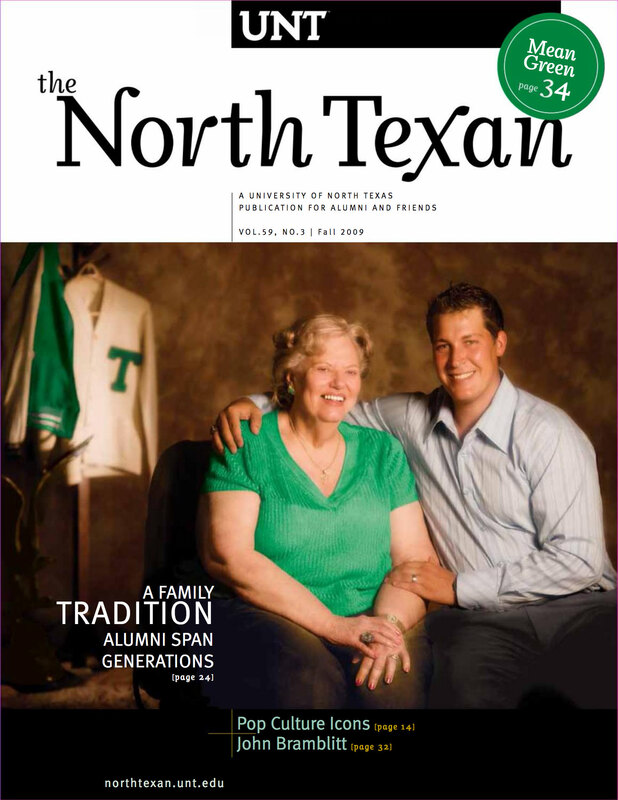 With a rich lineage, UNT’s family grows green pride as new generations of alumni write their own chapters in our story. In the true spirit of promoting lifelong learning, UNT debuts two new programs. UNT alumni use creativity to tap into America’s consciousness. Gerald “Jerry” Ringe (’05) reflects on musical experiences. Pride in the Mean Green grows with top honors and a future that includes a new stadium. At UNT, we truly are turning promise into progress. The event brought more than 100 academically gifted high school students to campus. Alumnus views the world through his paintings after losing his sight. How do you reduce stress once the vacation's over? A 1960s counterculture figure who lived with Andy Warhol is the subject of "Philip's Shadow." Clarence “Woody” Wood and Mary Ellen Standley Wood met and fell in love at North Texas. Readers share their favorite UNT souvenirs from over the years. "Nowhere But Texas 2" received top honors from the national Gracie Awards this summer. Alumna focuses on helping women feel empowered. The One O'Clock Lab Band performed at the 15th World Saxophone Congress. During a two-week trip, 14 Emerald Eagle Scholars explored the Costa Rican rainforest. Professor Emeritus of music and former student Bob Rogers happily transcribes sheet music. Matching active singles for low pressure lunch dates is the mission of UNT alumna Irene LaCota. Reader shares story of designing official UNT class ring. College of Music students won the International Trombone Quartet Competition. UNT alumna pits her designing skills against 15 others on hit show Project Runway. Reaching out a helping hand is second nature to Constance Lacy (’98).